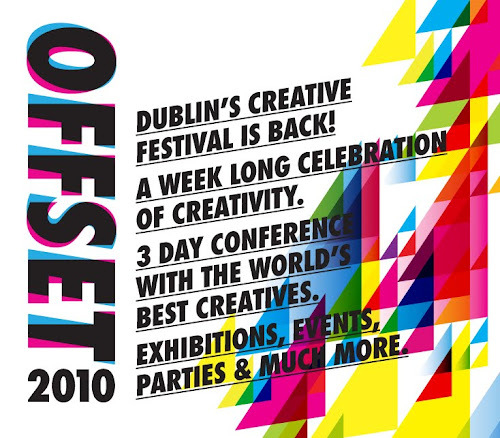 If you were ever looking for a reason to head over to Dublin, Offset 2010 might just fit the bill. Now in it's second year, Offset 2010 is set to take place in Dublin’s Grand Canal Theater from Friday 1st —Sunday 3rd October. Orgnasied by some super talented Irish friends of ours this awesome conference will feature some of the world’s top creative talent talking about their work, their ideas and their inspirations. In the run-up to the conference a week-long programme of club-nights, live performances, presentations, gallery shows and in-store events will also be taking place throughout the capital. The speakers at OFFSET2010 are internationally recognised in their fields. Some of the highlights include graffiti legend, Steve Power (ESPO), Marc and Sara from the Wooster Collective, the original Mad Man, George Lois, Wired magazine and Condé Nast’s digital publishing guru, Scott Dadich, celebrated illustrator and artist Gary Baseman, artis and Designer, Daniel Eatock and groundbreaking photographer Zach Gold. There is a whole bunch of info on the iloveoffset website for the event including the full line up of speakers, info on places to stay and travelling to Dublin. If you are interested in attending they have a limited Early Bird offer that will run until September 1st so get your skates on!! They have also have introduced a Student and Group rate this year so hopefully as many of you as possible can attend this year. Full details on the tickets can be found here.